I’m always impressed when the years move on and leave certain books unaffected. To the dismay of anyone trying to write for posterity (if there’s such a thing when there are bills to pay), decades can be very unkind to any kind of fiction. Beyond contemporary settings, there are dozens of ways for books to be stuck in time: outdated social assumptions, unfashionable prose or crude genre conventions. Even in Science Fiction or Fantasy, setting a story in the future or the past doesn’t necessarily erase the mark left by the writer’s present. So imagine my surprise to find out that F. Paul Wilson’s The Keep still feels just as fresh today as when it was published in 1981. One of the reasons why this book is still in print today is that it forms the cornerstone of Wilson’s Adversary cycle, which also spawned Wilson’s “Repairman Jack” series. 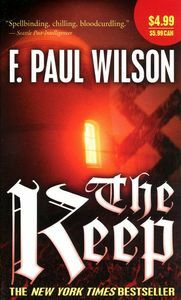 While The Keep initially looks and feels like a particularly ornate vampire story, Wilson has a larger framework in mind, and the barest hints of the menace are revealed in this first volume. Suffice to say that this isn’t a mere vampire at play, and that the roots and consequences of the novel won’t be limited to 1941. But the best reason for the novel’s continued popularity is that it’s slickly written and a hugely enjoyable page-turner. Wilson’s prose is clean and compelling, and his ability to keep readers coming back for “one more chapter” is terrific. While the tight suspense of the first half eventually cedes way to a looser second half, the strong characters keep up interest until the end despite ever-larger developments. The delight with which Wilson multiplies the complications (by bringing in “good” Nazis, the looming menace of another concentration camp, a mysterious stranger traveling to the Keep, unexpected shifts in allegiances, and so on) is the stuff from which satisfying novels are made of. Plus, hey, it’s all-too-easy to lose sight of the most excellent premise: Nazis versus monsters! What’s not to like? The historical detail is convincing, Wilson generally avoids the easy Nazi clichés and the first 150 pages are a model of increasing tension. No small wonder that The Keep still attracts an audience more than a quarter-century after its publication. Even for experienced horror readers, the novel still carries its own kick. There’s a good chance that The Keep will still be just as readable in 2031.